There are plenty of mountain bike forks available in the market from popular UK brands to fit in your bike to make it a reliable cruiser. All these bike forks have decent quality and performance, which are categorized based on the type of riding style. Some of the mountain bike suspensions are designed for medium off the road riding like ‘All mountain bike’ while other forks are completely designed for downhill/freeride setup. Some light weight bike forks are designed for cross-country while other forks are designed to cater the need for strength. This Mountain bike fork buying guide would help you to understand various types of forks and enables you to choose right fork for your mountain bike. Finding a suitable mountain bike suspension that best suits your riding style is very important especially when you customize the bike based on your preference. If you are on tight budget and want a lower priced front fork, then look for good entry level mountain bike forks from top brands such as Marzocchi, Manitou, Rockshox, and Fox. Used forks are also an alternate choice, but it needs your attention to checking all the internal parts. Always choose the bike fork based on the riding you do and it must perfectly fit your riding style. Riders normally would not fit Rockshox Duke in a Specialized Big Hit FSR that looks contradictory and whole concept of downhill/freeride would be lost in the bike as well as the bike frame would get strained out, which results in lesser lifespan. There are two types of forks available such as Coil Sprung and Air Sprung fork. Coil sprung suspension is suitable for aggressive riding style while light weight Air sprung suspension is suitable for XC riding style. This long travel suspension is not suitable for cross-country riding style. It is only designed for downhill/freeride, 4X jump and trail riding bikes. Traction is the most important factor needed for any aggressive mountain bike riding and the long travel fork delivers perfect traction. Similarly, short travel fork is classified between 80mm to 100mm of travel, which delivers quick steering bike. This short travel suspension is only suitable for the cross country type where there is no need for any traction. Coil Sprung fork is the most famous of all forks and generally used for all-round bikes. This coil sprung suspension is ideal choice and well fits into your budget. When you customize the bike with this long travel fork it will give you enough room to fine-tune and adjust for desired riding style. The advantage of the coil sprung front fork is it is easy to maintain and service. The major downside of this type of fork is that a steel spring inside the fork adds extra weight to the bike. It does not mean that it is of lesser value, the extra weight means it is tougher and strong fork usually recommended for downhill and freeride racing. If you do a lot of jumping and downhill, then this type of fork would suit you and it takes all types of punishment during trail riding. It is purposely built heavier to add enormous strength, which is extremely needed when you perform a lot of jumps, full tilt downhill and various trail riding. Air Sprung fork comes under expensive segment and more suitable for cross-country riding style. It is considered to be a reliable choice for XC riders who expect some adjustment in the fork. This Air sprung suspension lets you to cut the weight of the suspension and instead of the coil it uses the air pressure inside. You can adjust the air pressure using a shock pump to suit your riding taste. Some Air sprung front fork is also designed to use it for moderate freeride and even for medium downhill. The recent trend has made many riders use air sprung fork for different trail riding. Air suspension forks are getting more and more convenient these days and many manufacturers try to launch less priced Air forks. It is also designed for 4x with well-designed jump suspension fork, which could take up big landing with less compression for stability on platform. Medium size air suspension fork is available with 80mm – 100mm and even most advanced air suspension is also available with rebound and compression damping adjustment up to 180mm of travel, which is very expensive. Many long travel forks come with travel adjustment features, which would enable you to tweak geometry of the bike frame by reducing the travel a little. By reducing the travel in little steps you can fine tune the riding style. Sometimes you can also fully drop the travel to make the fork stiffer and shorter riding style. All the four major front suspension brands have their own travel adjustments setting. 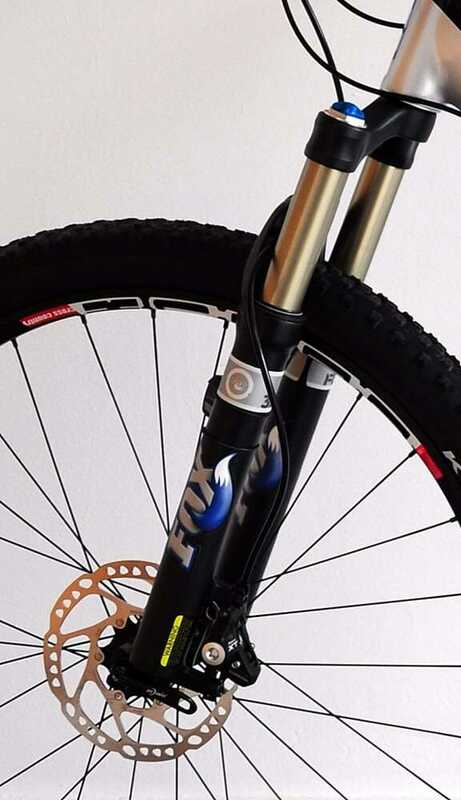 Fox racing suspension comes with Talas system were as Rockshox comes with U-turn system. Similarly, Marzocchi and Manitou do follow their own pattern of travel adjustments. Mountain bike forks always come with factory setting and have minimum preload setting. Preload can be adjusted by just turning the cap clockwise direction, which is placed at the top of the stanchion or upper leg. When you turn the cap for preload adjustment the spring inside the suspension is pressed down to make the fork stiffer. If you are a beginner, then there is no need to adjust the preload. There are two type of damping control adjustments such as adjustable rebound damping control and compression damping control. Adjustable rebound damping helps to control the speed at which the fork returns back to its original height after pressing. This rebound damping adjustment would also avoid the bike fork bouncing back with a clang. The rebound adjuster is only suitable for advanced riders and beginners no need to worry about the adjustment. Compression damping is opposite to rebound, which slows down the speed at which the spring compresses and absorbs the impact. Only few mountain bike suspension allow the users to adjust compression damping and this feature is available with most advanced and higher priced suspension. Advanced riders make use of this compression damping adjustment and they know what they are doing and they correctly tune them to try different riding style. The most versatile suspension enables the riders to split the compression damping into two extremes such as low speed and high speed. Low-speed compression damping would pass all the pedaling power to the bike without loss in acceleration and controls the loads like cornering and braking. High-speed compression controls high impact on the rocky trail or heavy landing. A Mountain bike frame designed to fit 80mm of travel can also be customized to fit up to 120mm of travel suspension but it cannot accept more than 120mm. For example, some riders would like to customize cross-country bike with maximum compatible long travel fork of about 120mm suspension in order to make it comfortable for moderate Freeride and Downhill. Similarly, a mountain bike frame designed to fit 180mm of travel suspension can also accept between 140mm – 180mm of travel suspension. Travel: It is the measurement of the fork that travels down when fully compressed. It is usually measured in an inch or mm, e.g. 180mm of travel downhill fork. Crown: It is a metal brace that is fixed with steered and made to hold two stanchions or upper leg together. Stanchions or Upper Leg: Two upper legs or stanchions are fixed with the upper crown. The other end of stanchions is inserted into the slider or lower leg. Lower Leg or Sliders: It is a moving part of the fork called slider or lower leg. These telescopic legs are joined together with the stiff metal brace at the top to prevent them from moving independently. Damping: It is the name given to control the movement of the fork. When a force of impact applied to the fork, oil inside the suspension is pushed through the holes to control the fork from bouncing up and down and this control is called damping.